The following lists show all system-wide Interstate business routes currently signed and previously posted. Within the following tables, “retired” denotes decommissioned business routes, “active” denotes currently maintained or signed business routes, “proposed” indicates the business route may have been proposed at one time or is a future route and “unsigned” means the loop or spur is officially recognized but is not signed in the field. Interstate business connections (loops and spurs) were approved by AASHTO in 1964 as a method to provide access from the Interstate superhighway to the cities and towns bypassed by the freeway. AASHTO made this decision during the height of Interstate highway system construction. While primarily geared toward U.S. Highway business routes, AASHTO Policy HO1 defines a business route as “a route principally within the corporate limits of a city which provides the traveling public an opportunity to travel through that city, passing through the business part of the city, while the regular number is used to obviate passing through the congested part of the city. This ‘Business Route’ connects with the regular numbered route at the opposite side of the city limits. ‘Business Route’ numbering shall be established by the placing of a standard strip carrying the words ‘Business Route’ on the staff above the U.S. shield.” Business routes are marked with a white on green variation of the standard tri-color Interstate shield. As the Interstate Highway System neared completion, business routes became more prevalent. Business loops were commissioned in some areas where the U.S. route still existed as a means to entice travelers to exit and use services available in that town or city. These routes consisted of surface streets through the city center, older arterial bypasses around the city, divided highways with some grade separated interchanges and other non-limited access routes. * – Maryland and New Jersey have designated Interstate Spur routes. These are not conventional Business Routes, but rather branches from a parent Interstate that are inventoried with a lettered suffix. With the exception of one sign for I-270 Spur, this collection of routes are unsigned. Business Interstates are most often posted in the western states, across the Great Plains and in Michigan. Eastern states generally did not designate business loops, as most of the Interstates paralleled the original U.S. routes instead of directly replacing them. 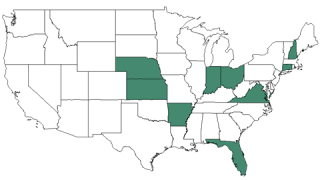 With the exception of mountainous areas, this left most of the U.S. highways in place, or as co-signed routes with the parent Interstate, while the former routes were redesignated as local or frontage roads. In contrast, construction of the Interstate system in the western states often directly overlaid the old U.S. highway, leaving the former road impassable or as a disconnected route. Exceptions were at cities and towns, where the freeway would shift onto a bypass around them. This often left extant segments of old U.S. Highways in place, with a business loop designation applied to them as a motorist aid to and from a business district of collection of motorists services. Implementation and maintenance of business routes varies from state to state. States like Illinois, Michigan and Wyoming incorporate Interstate business routes within the state maintained system. These routes tend to be well signed given their status as state routes/highways. Other states like California usually transfered responsibility for business route maintenance to a local municipality when the bypass route (Interstate mainline) was completed. Local maintenance includes posting signs and replacing them as needed. Some states such as Nevada, South Dakota and Washington allow business loops to fall under local control by cities and counties while also maintaining others as state routes. The I-5 business loops in northern California replaced U.S. 99W towns such as Woodland, Arbuckle, Williams, Willows, Orland, Red Bluff and Redding. The I-15 business loops in Utah overlaid old U.S. 91 through cities such as St. George, Cedar City, Parowan, Beaver and Nephi. Notably, most business loops in Utah are cosigned with a different state highway route number. The I-55 business loops in Illinois replaced U.S. 66 through the cities of Springfield, Bloomington-Normal and Lincoln. The I-94 business loops across North Dakota were designated along former U.S. 10 through Dickinson, Mandan, Bismarck and Valley City. The I-25 business loops in Wyoming, which provide direct access from the freeway to the original U.S. 87 route through cities such as Cheyenne, Wheatland, Douglas, Casper and Buffalo. Business routes in Wyoming are usually cosigned with U.S. Business routes from the parent route. Business Loop I-70 in Denver follows U.S. 40 across the metropolitan area while a second in Limon runs concurrent with U.S. 40 through Limon. The I-75 business loops in southern Georgia, which connect to and supplement U.S. 41 through cities such as Tifton and Cordele. Business Loop I-15 through Pocatello, Idaho overlaps with U.S. 91 and 30.
Business Loop I-40 through Amarillo, Texas doubles as U.S. 60 across the east side of the city. Business I-20 Spur from the I-20/95 junction into Florence, South Carolina. Business I-44 Spur into Fort Leonard Wood, Missouri. The Business I-495 Spur Freeway into Lowell, Massachusetts was the lone spur within this category. Prepared and updated by the Arizona Department of Transportation (ADOT), the State Highway System Log, provides updates on the status of all Arizona state highways, including business loops and spurs. Arizona has studied the removal of nonessential business routes from the state highway system. ADOT Route Transfer Procedures Study from June 2012 states that “Priorities for route transfer are: … c) Existing business routes not necessary for system continuity.” Unlike some other states, Arizona generally will not sign business loops on non-state maintained roadways. 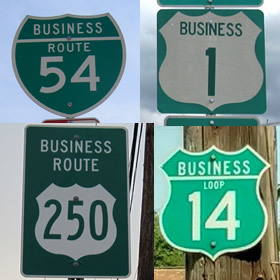 With the exception of a thicker border and horizontal rule, the basic sign design for Interstate Business Loops have not changed much over the years. Occasionally states will post markers without the word Spur or Loop. Sioux Falls, South Dakota replaced the word Business with Downtown. Business Loop shield specification from the 1963 Illinois Manual of Uniform Transportation Devices. Scan courtesy of Michael Summa. (4) Business Routes. A Business Route generally is a local street or road in a city or urban area, designated by the same route number as the through Interstate, U.S., or State highway to which it is connected, with the words “Business Route” attached to the identifying route shields. The Business Route designation provides guidance for the traveling public to leave the main highway at one end of a city or urban area, patronize local businesses, and continue on to rejoin the main route at the opposite end of the city or urban area. The Transportation System Information Program is responsible for approval of Business Route designations. Applications for Business Route designation and signing must be made by written request from the local government agency to the Chief of the Transportation System Information Program. 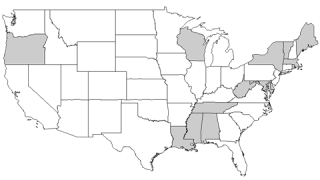 U.S. and Interstate Business Routes require approval by the AASHTO Executive Committee. The ROUTE ## BUSINESS sign may be used to direct motorists to an established U.S. or State numbered business route or an Interstate business loop from a State highway. The plate should be installed below an advance ground-mounted directional sign. The sign may be placed separately in advance of the business route if it is necessary. A NEXT RIGHT/LEFT message may be used on expressway and conventional highway installations. A NEXT EXIT message may be used on freeways. 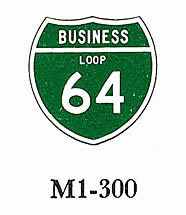 The INTERSTATE BUSINESS LOOP sign may be used to advise motorists of an established Interstate business loop. The sign should be installed on the right on the loop. It should not be placed on the Interstate route itself. The ROUTE ## BUSINESS plate should be used for advanced signing on the Interstate route. The BUSINESS plate, in appropriate color, may be used to indicate an alternate route that branches from a US or State sign route, passes through the business district, and rejoins the route. The plate should be placed above the ROUTE SHIELD sign. The INTERSTATE BUSINESS LOOP sign should be used on an interstate business loop. The ROUTE ## BUSINESS plate should be used for advanced signing on U.S. or State sign routes. 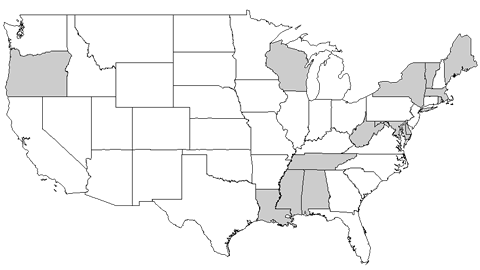 State business routes and Interstate Loops are established by the District Directors. A Business Route generally is a local street or road in a city or urban area, designated by the same route number as the through Interstate, U.S., or State highway to which it is connected, with the words “Business Route” attached to the identifying route shields. 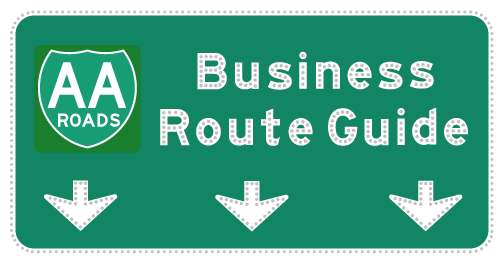 The Business Route designation provides guidance for the traveling public to leave the main highway at one end of a city or urban area, patronize local businesses, and continue on to rejoin the main route at the opposite end of the city or urban area. The Caltrans Division of Transportation System Information is responsible for approval of Business Route designations. U.S. and Interstate Business Routes require AASHTO approval. Submission for AASHTO approval shall be made Caltrans, Headquarters. Continuous business route signing shall be provided through the bypassed area and back to the highway. If a business route is approved prior to relinquishment, Caltrans shall install BUSINESS (M4-3) auxiliary signs or Off-Interstate Business Loop (M1-2) markers. After relinquishment, they shall be installed by the local agency involved. Research from the former Highways of Colorado web site by Matt Salek revealed that the CDOT route logs inventory Interstate Business Loops and Spurs only if they are not concurrent with another numbered highway. An exception occurs with the Grand Business Loop for I-70, which overlaps with U.S. 6 & 50 to the west and U.S. 6 again to the east. Additionally CDOT also has a system of unmarked business spurs, which act as minor or major collectors between the parent freeway and a city or town. Business Loop (BL) – A business loop is a surface route that leads into a downtown business district and returns to the freeway at the other end. Frequently, the business loop is the alignment of the original highway before that highway was bypassed. Business Route (BR) – A business route connects the freeway or through highway with the downtown and commercial areas of a city or town. Business routes are primary arterials and begin and end on the Interstate. Business Loops and Business Spurs are types of Business Routes. Business Loop implies that the business route will return to the parent route, while a business spur implies that the business route will only spur into the commercial area and not return to the parent route. Business Spur – A business spur is a surface street route leading from the Interstate highway into the central commercial district. The spur route ends upon reaching a specified point within that urban area. All Interstate business routes within the Land of Enchantment are inventoried on the New Mexico Department of Transportation (NMDOT) Posted Route – Legal Description lists. Routes are identified with a unique number separate from Interstates 10, 25 and 40. 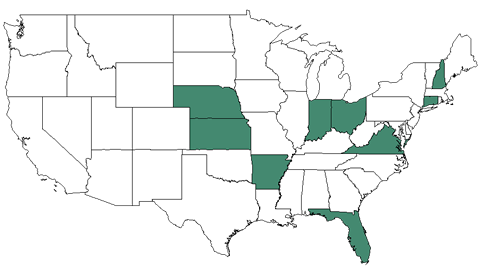 11 total routes remained under state control as of March 16, 2010. Minimum standards for motorist services are also required prior to designation of a business loop or spur in Utah. For example, at least two gas stations must be open at least 16 hours per day seven days per week. The gas stations must provide fuel, oil, water, modern sanitary facilities, drinking water, and a public telephone. Additionally, at least one restaurant that operates continuously at least 14 hours per day, seven days per week, serving three meals per day, licensed by the appropriate public agency, with modern sanitary facilities and with the primary business purpose of preparing food must be located along the business route. Finally, a motel or hotel with at least ten rooms (with private modern sanitary facilities, licensed by the appropriate public agency, with a public telephone) must be located along the Utah business route. This policy explains why most Utah off-Interstate business route are found in the less populated areas of the state and generally not among the communities of the Wasatch Front. According to Dan Stober, UDOT specifies a state route counterpart for all Interstate Business Routes posted in the state. This may incorporate one or more routes. The state maintained highways see business route markers posted from the freeway toward the city center or business district and Interstate trailblazers leading back to the parent freeway. Wyoming and several other states also adheres to this signing practice. 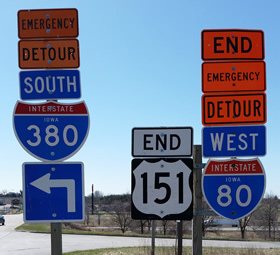 Another subsection of Interstate highways are Alternate, Detour, or Emergency routes. These are marked with trailblazers or on small sign panels with the standard Interstate shield posted below a banner stating its classification (which varies from state to state). They are commonly posted on other state-maintained facilities, rural highways or collector routes paralleling Interstate highways in Indiana, Michigan, Wisconsin and a handful of other states. The alternate routes may intersect one another. These routes are used for incident management to redirect traffic during emergency or temporary road closures along the parent freeway. Various characteristics factor into what route is designated as an Emergency Interstate Route, such as roadway geometry vs. the primary route, locations of schools, community facilities and at-grade railroad crossings. Routes are usually marked with permanent signing, placed in advance or on the near side of an intersection, and after a turn made by the route. The MDOT guidelines specify placement at a density of approximately five miles between confirming assemblies. Much more about Emergency Interstate routes is detailed in the Best Practices for Emergency Rerouting – State of Michigan. Interstate Business Route markers occasionally appear on non-freeway routes, generally in error or in local installations. Two notable examples are located along California 54 Business in El Cajon and along U.S. 30 Business in St. Helens, Oregon. Other business routes using a green on white scheme are posted at various locations across the country. U.S. 1 Business in both Waycross, Georgia and Bel Air, Maryland uses the standard US route marker but with green on white, while the same is found for U.S. 50 Business across Salisbury, Maryland. Another use of this style appears along U.S. 250 Business through New Philadelphia, Ohio. Green on white cutout U.S. route markers take the setup further for U.S. 14 Business in Huron, South Dakota. Mark Bozanich provided some background on the use of Interstate Business Routes in the Evergreen State: “For the most part, business routes in Washington State are not part of the state highway system. It is harder for the state to get counties and cities to cooperate in posting signs along business routes than to post signs that are on state highways.” So while the business routes are generally locally maintained, the city and county governments are less likely to maintain consistent signage or replace signs as needed. Additionally signs posted on roads and streets intersecting Business Loops and Spurs for the route intersected tend to be omitted. Page updated September 1, 2016.